From the Northwest. Where it's Always Green. Times are changing. All sorts of people are using herbs as safe and effective medicine, as an aid to creativity and as a way to relax without the morning after hangover. And contrary to that old 60’s image, most of those people are actually getting stuff done! Yes, our attitudes have matured. But, by and large, our smoking accessories have not. We wanted to change that. And at a time when that shiny new smartphone is obsolete in just a few years, we wanted to create products that we could enjoy for a lifetime. So we decided to design the kind of gear we longed for; a line of simple but elegantly designed accessories for the smoker who knows that beautiful surroundings make any experience just that much better. 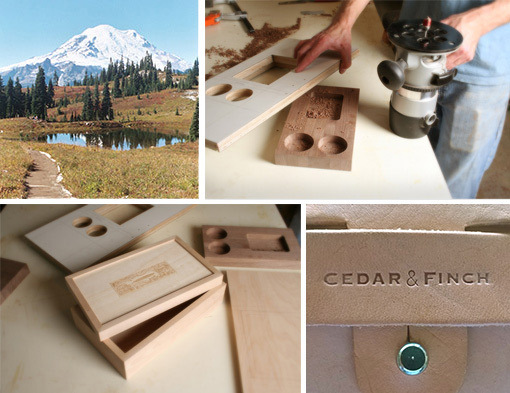 After exhaustive trials, Cedar & Finch bring the fruits of our labor here to you. As all the products are hand-made, they will be offered in limited supply but with the hope that there is no limit to the enjoyment that they bring. We appreciate good design and beautiful craftsmanship. There is something very appealing about a well constructed hand-made wooden box. Or fine leather work. We also appreciate creativity in all its forms. Check out our social media posts from time to time where we'll share cool things that we find in the world of art, music and health. And remember the internet works both ways. If you hear or see something awesome, send us a link.